Featured amenities include a 24-hour front desk, multilingual staff, and luggage storage. A roundtrip airport shuttle is provided for a surcharge (available on request), and free self parking is available onsite. Take advantage of recreational opportunities offered, including an outdoor pool, an indoor pool, and an outdoor tennis court. This hotel also features wireless Internet access (surcharge), babysitting/childcare (surcharge), and gift shops/newsstands. When you stay at Cynthiana Beach Hotel in Kissonerga, you'll be on the beach, within a 15-minute drive of Coral Bay Beach and Tombs of the Kings. 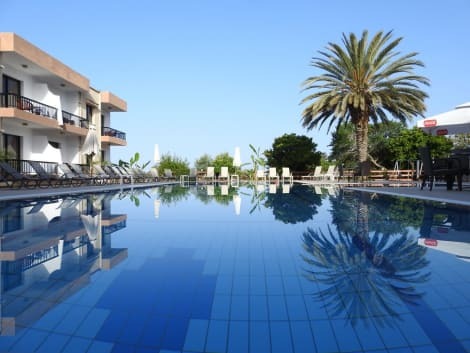 This beach hotel is 5.8 mi (9.4 km) from Paphos Harbour and 5.3 mi (8.5 km) from Paphos Archaeological Park. Relax on the private beach or enjoy other recreational amenities such as an outdoor pool. Additional amenities at this villa include complimentary wireless Internet access, tour/ticket assistance, and barbecue grills. Enjoy recreation amenities such as an outdoor pool or take in the view from a garden. Additional features at this aparthotel include complimentary wireless Internet access, a television in a common area, and tour/ticket assistance. Mingle with other guests at the complimentary reception, held daily. Featured amenities include complimentary wired Internet access, a business center, and complimentary newspapers in the lobby. A roundtrip airport shuttle is provided for a surcharge (available 24 hours), and free self parking is available onsite. lastminute.com has a fantastic range of hotels in Kissonerga, with everything from cheap hotels to luxurious five star accommodation available. We like to live up to our last minute name so remember you can book any one of our excellent Kissonerga hotels up until midnight and stay the same night.